People often ask these questions, and I find them difficult to answer. Let me tackle each by offering some general observations, followed by a few specific suggestions. What you are selling, that is, how desirable the pattern or piece may be. The condition of what you are selling. Where you are selling it – dealer, shop, show, flea market, Internet. To know what you are selling, you need to identify the pattern. For tips on doing this, visit Identifying Your Silver at this website. If you have a set, count of the number of place settings as well as what pieces make up each setting. If some of the place pieces needed to make a full set are missing, be sure to note that. Also list the serving pieces if any. If you are unsure about the identity of some of the pieces, Replacements offers an excellent Identification Guide at their website. Be critical about the condition of your silver. Pits, erosions, deep scratches and bare spots will not polish out, as some people hopefully believe. Inspect fork tines and the edges and backs of spoon bowls for evidence of wear. Silver is only “mint” if it has never been used and it is only “like new” if you cannot see any difference between it and unused silver. Condition strongly affects the value of any second-hand item. 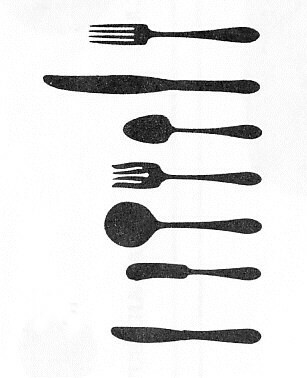 A dinner fork may be perfectly usable, but if its tines are worn down its dollar value is small. The place where you sell affects the buyer’s perception of value. An attractive piece at a high-end antique show commands a higher price than the same piece at a flea market. No dealer can pay full retail price or “book value” for your silver and stay in business. If you sell to a dealer, you must discount the sale price. In return, you gain convenience and save time. It is your choice. So, how do you discover the retail price, since that is presumably your starting point? Tere Hagan, in her books for identifying flatware patterns, Silverplated Flatware and Sterling Flatware, offers ratings of collectability – which simply means how much demand is there for a particular pattern – with average prices. 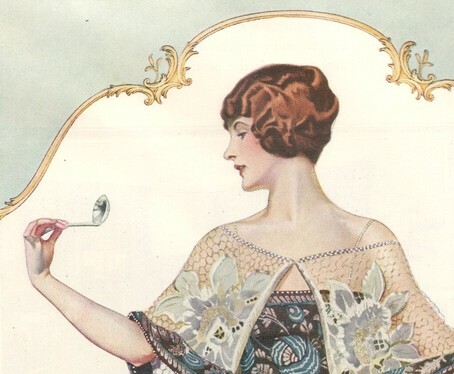 For silverplate she specifies “like new condition with no monogram”; for sterling, “found flatware with no monogram or monogram removal.” For more information about her books, as well as other reference books, consult Books about Silver at this website. Be wary of price guides which quote high prices for silver without indicating where the sale took place or the condition of the silver. Another place to check retail values is the Replacements Ltd. website. Their inventories list retail prices for items in excellent condition; if lesser conditions are listed, the price discounts are indicated. Finally, for research I recommend Internet auctions like eBay as places where real people are paying real money for real items. A search of completed auctions tells you not only what the sale prices were, but also what items attracted little or no response. Internet buyers are a mixture of dealers and collectors. Dealer prices usually prevail on relatively low-demand items, while scarce or high-demand items may attract a strong collector response. So when a person tells you that he sold for more on the Internet, while someone else says he sold for less, both are probably correct. If I have a rare item, I can find an international market on eBay. If, on the other hand, I am selling something relatively common I am in competition with all those other sellers who are offering the same item. If you research the value of your silver in reference books, at Replacements and other websites and on the Internet, you will probably also reach some tentative conclusions about how to sell it. Here are my suggestions. Polish your silver! That is the only you can truly judge condition. Polishing makes the silver much more attractive to the buyer. If you feel the silver is not worth polishing, consider whether anyone else would want to buy it and polish it. If you have a shop, a mall space, or sell at flea markets, you already know what price levels your customers expect. Your research should have helped you to learn the level of demand for your silver, allowing you to set a price within your usual scale. Price aside, damaged silver moves so slowly you should question whether it is worth spending time on it. On the other hand, a very desirable item might bring a higher price in a different location. If you want to sell to a shop or show dealer, first polish your silver. Then, when you show your silver to the prospect, he or she can judge its condition. If you are describing it by mail or telephone, you can be accurate in your description. Dealers almost never buy damaged silver. You can find many dealers by searching the Internet. Be prepared to accept 10%-25% of retail value for common items in excellent condition. Highly desirable items may bring 40%-50% of retail. To sell on the Internet, first watch the action for a while to get an idea of the rules of the game. If you are truly new to Internet buying and selling, buy a few inexpensive items first, both to understand the buying experience and to build some positive feedback. If all of this sounds like too much trouble, consider finding someone to do it for you, using the eBay Trading Assistant program for example. Place a classified ad in a local paper or trading publication. Send it to local auction. This is appropriate for sets of patterns in low demand or mixed box lots of odds and ends. Offer it at a local consignment shop. Sets of attractive (polished!) and useful silver that is not particularly collectible may do well in this venue. Put it out at your next garage sale. Finally, consider giving the silver to charity. Your church or community group can use the money from its sale, while you have the pleasure of supporting a cause you believe in. My comments are not meant to devalue your silver. I love American silver and admire the skill and imagination that went into its creation, but selling any collectible for full price is real work. Dealers build loyal customers by treating them fairly and educating them about what they are buying. As an individual with a relatively small amount of silver to sell, you may not have time do this. If the silver you want to sell is family or inherited silver, consider passing it along to a friend or family member who will appreciate it as you do. 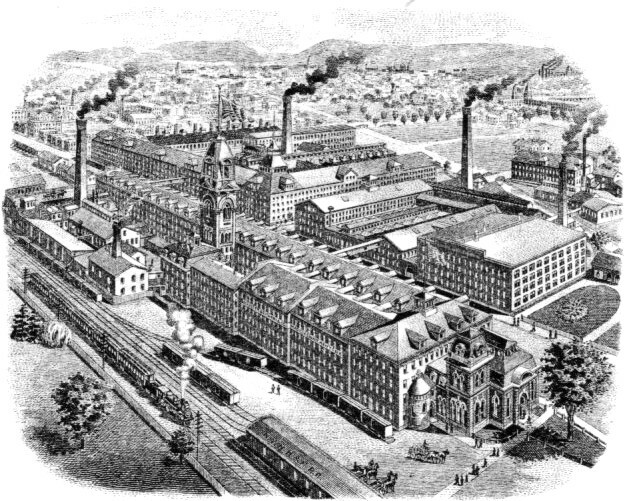 International Silver Company, Meriden, Connecticut — a major industry at one time. 5 Responses to What Is My Silver Worth? I recently sold from/in the U.S. a set of RODD Balmoral, 58 pieces, for US$300.00, with a fine wood storage chest. The set was never used and the buyer was very happy to get it. . You can Search the Australian online auctions for Sold prices to determine what current retail may be. If you put your set on eBay (AU) you will probably get interest as this style is getting ever harder to find even in AU or NZ, not to mention in fine condition of course. Of how much use but I’d say minimal. I think eBay users would be around $250-$350? Are ther any places in Perth Australia I can take this to be valued? I have 8 1939 Worlds Fair Silver Plated spoons, all different buildings denoted on each. I see many different prices on the internet for individual spoons, but I wanted to sell all of them. Is it better to sell them individually or as a set? I also have a Holmes and Edwards flatware, but I am not sure if prices on the internet are representative as I have many pieces. On the fence about which venue I will use to sell it. Your Worlds Fair spoons probably have more value as a worlds far collectable than as silverplate. There must be a market for such collectables and you can see how items are priced and sold there. Holmes and Edwards is a quality mark but not all the patterns are equally desirable. You need to identify the pattern or patterns in order to make a judgment about value. I have a meat fork in mint condition. It is in the grape pattern. Could you give a general idea what it would be worth?